Everyone has their thing. You know, the thing that they are willing to spend more money on. Some are cars, many prefer vacations, while others will spend it on clothes. Mine is a house. The home is such an important place for me. A place I want my family to feel safe, loved, and cozy. A place for friends to gather and fellowship. A spot for our children’s friends to want to hang out. Ultimately, a place where people feel welcome and “at home.” Even though I’d spend more money on a home than other things, our home is just right for us in this season of life and it’s within our means. Our home is considered “small” according to the average size of a house in America. The average size of a home in 2013 was 2600 square feet. Our house is around 1960 square feet. In most research I found, 2000 square feet or less was considered on the smaller side (which sounds a little crazy to me, but nonetheless). We are a family of 4 (2 adults + 2 kids). In my opinion, I think it’s plenty big. Even so, I’d be lying if I said I didn’t want a bigger home in the future. Personally, I’m more into the details and decor of a house vs. its size, but I sure would like a big kitchen and a big backyard (like really big). Where I live, our house is considered small for sure. Sometimes it can be discouraging, but I have to remember the bigger picture (our life goals) and that this would be a house some would only wish for. 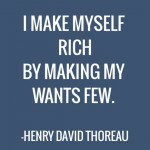 And I don’t mean that in a condescending way…more in a “quit being ungrateful with what you have” way. Our house fits our needs right now, plus it’s incredibly affordable ;), freeing up money for more important things like college, adequate retirement, staying home with the kids, and even vacations (I value the intangible stuff that vacations can create). And I don’t have anything against bigger houses that are affordable…I hope to be in one someday. With that said, I’ve realized some incredible things I love about living in a “smaller” home. These are particular to the area I live in. 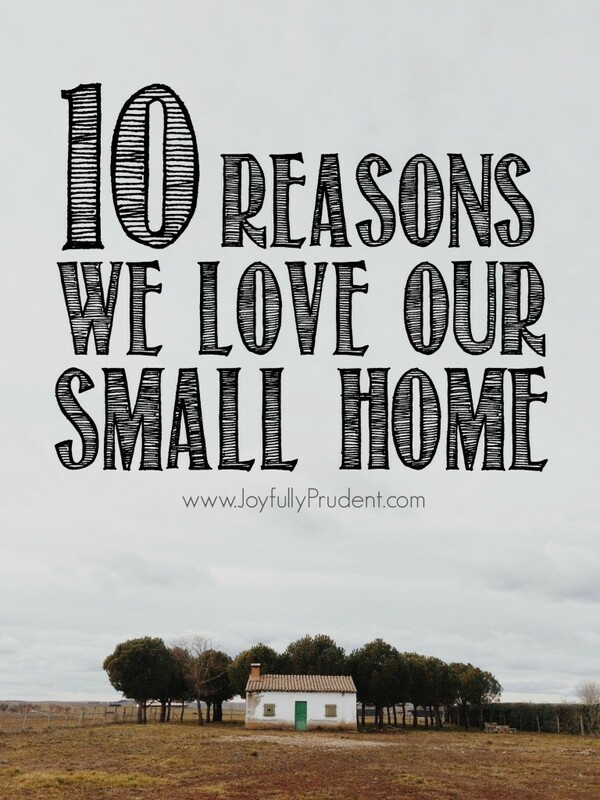 Here are 10 reasons I love living in our home. We don’t have a maid, so I do all the cleaning. Ryan and the boys definitely help out, but I consider that my role as a homemaker and I love doing it actually. I’m very particular with how I like it done too, so I prefer to do majority of it. When you have less square footage to clean, it takes much less time to clean. With two small children, cleaning is like breathing around here…it’s constant. So I’m grateful for a smaller home to clean. Another benefit is it costs less to clean – less money spent on cleaning products. Pretty obvious with this one too, but smaller home, smaller bills. It takes a lot more electricity to run a 3,000 square foot house than ours. I’m sure you’ve seen this quote all over Pinterest, but the full quote is as follows: “Love grows best in little houses with fewer walls to separate. Where you eat and sleep so close together, you can’t help but communicate. If we had more room between us, think of all we’d miss. 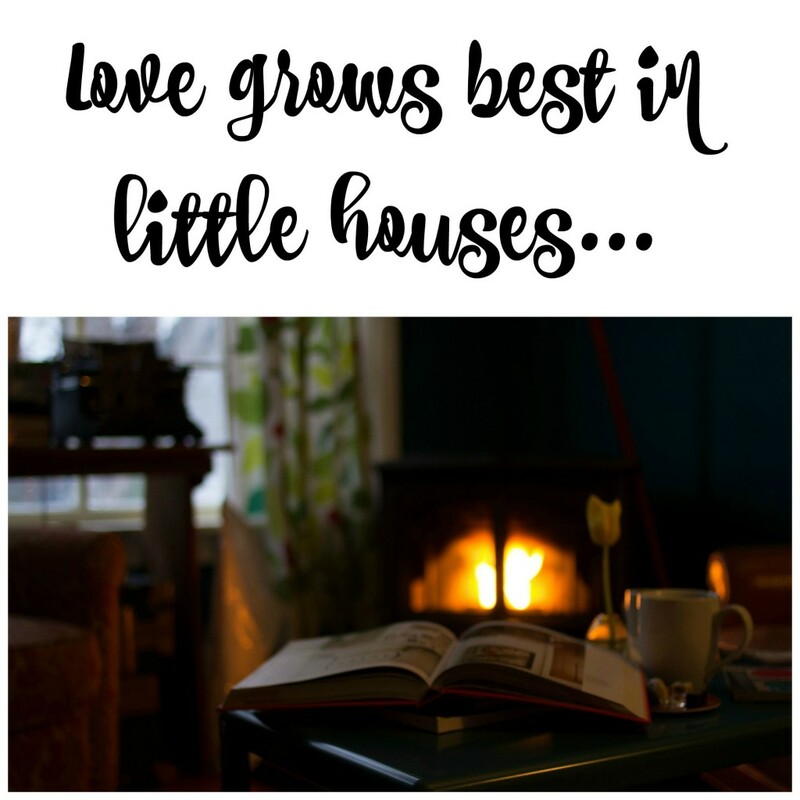 Love grows best in little houses like this.” For the record, I think love can grow in all sorts of places, but this is a comforting quote for small home owners. 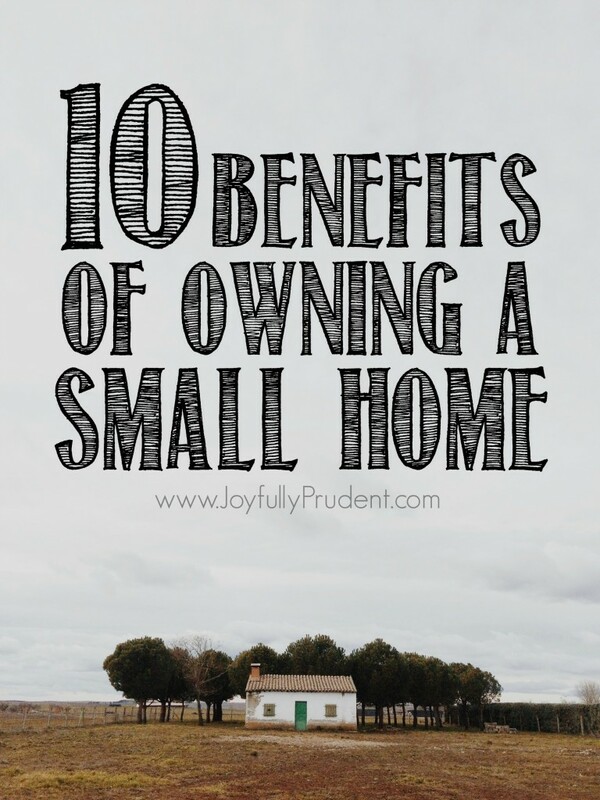 In general, a smaller home costs less (there are obviously exceptions to this). There are many benefits of a lower mortgage, but one that I love is that you are able to pay it off faster, saving you SOOOOO much money in interest (inevitably, someone will argue the tax break you get with a house…it’s still not better, not even close). We haven’t had a mortgage payment in 6.5 years and I can’t tell you what that money has done for us over time. With a lower mortgage, comes lower taxes also. I mentioned this above, but if you’re saving money on your mortgage, you are able to better save for retirement and college. Did you know most people are not fully funding their retirement plans? Ryan and I could get a bigger house tomorrow, but we’d have to give up our retirement and college savings for the boys. Not happening. Smaller spaces require less energy, water, etc. There are many other ways a smaller house is better for the environment that you can read here. I can honestly go through our house and point out the uses of each room/space. We could probably even take out our dining room (which we actually eat at every night) and still be okay (we have a small breakfast nook). I debated including this one, but it’s actually one of the more important reasons for us. This is strictly a personal reason. I like that my kids are growing up in a smaller than average home (according to America’s statistics). I want them to remember that mommy and daddy didn’t start off in a big home. I want them to see firsthand a successive build up to nicer things. I see too many kids graduating college (with tons of student loans as well) and purchase a house completely out of their means, resulting in financial catastrophe. I think even my generation (me included) expect nicer things at the start of our careers/marriages (even in our mid-30’s). Aside from my personal reasons, there is plenty of research that shows the correlation between an adult’s spending habits and how they were raised financially. You can read this book for more information. I grew up in a 3 bedroom, 2 bath house with 4 kids (3 girls, 1 boy) and my parents (5 kids at one time) that my parents still live in today. I shared a room until I was a sophomore in college…I knew no different. The memories in that house…oh the memories. Going back home is such a great feeling. My parents could have afforded a bigger house but chose to send us (yep, all 4) to a Christian school. I’ll be forever grateful for that. My childhood was awesome, my family was very close (and still is)…and we didn’t have a huge house. In addition to cleaning as I mentioned above, you have to furnish and decorate a house. It’s much more affordable to decorate a smaller home. I think about how much it would cost to furnish and redecorate a new home for us. I love decorating and I don’t feel so bad changing things up when I have’t spent thousands of dollars on furniture or decor. Additionally, maintenance on major appliances and units are more affordable. There is something about a small space that is just cozy. I can’t even put it into words, but it’s just a feeling. I often think of the show Fixer Upper when I think of this. Almost every home they fix up is “small” and yet, with the right decorating, I’m in love with it. It’s like that feeling you get when you sit down in a small coffee shop with a friend. If I can make someone feel comfortable and “at home” when they’re in my house, then I’m happy. Disclosure: This post includes affiliate links in which I may be compensated a small percentage if you click on them. I never include anything in my posts that I do not love or use myself. Thank you for your support. I love love love this post! Back in Charlotte we lived In a 5 bedroom 4200 sq foot home, it was great, lots of space, we had a large bonus room also, and it was great….it sucked cleaning it! 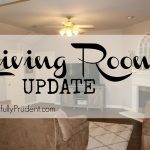 When we moved to Florida, we had to find a place to live in about 3 weeks (we decided to rent our first year here to give us time to decide on an area to settle in) we downsized DRASTICALLY. I was freaking out at first, but after living in a much smaller home for the last 7 months mark and I both agree we would never again have a big house. We have had to get a little creative with the space to really make it work for us, but it does and we just couldn’t be happier. 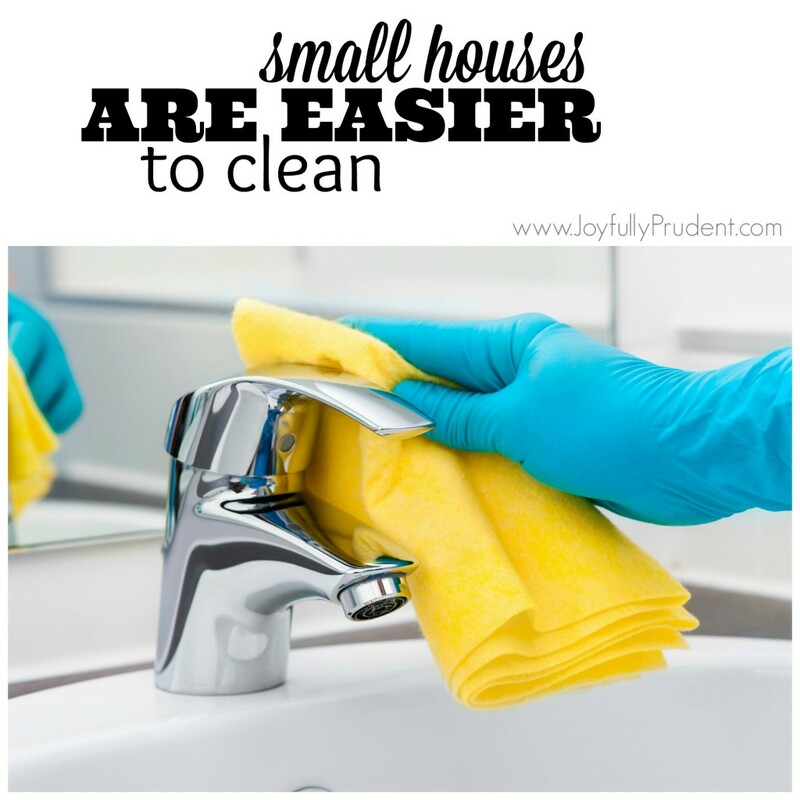 It’s so much easier to keep clean, and from a financial standpoint it’s awesome! I definitely don’t feel bad or ashamed of our small house! That’s cool to hear from someone who has lived in both. I think I want a bigger home but I don’t know if the grass is greener, you know? It’s nice to have lived here to start off with at least…I know exactly what I want in our next house and what things could be bigger/smaller/etc. The nice thing about having 2 boys already is that if we ever decided to go for another, the boys could share a room. They will eventually share a room anyway even if we don’t. Definitely a plus on the cleaning. We area family of 4, two children ages 9 and 19. We live in a 1100 sq. foot house and it is our HOME. It started out as our newlywed starter home 20 years ago. When we were expecting our second child, we too thought we needed a larger home, it’s only a 2 bedroom, 2 bathroom house. We moved to the larger house on some acreage, 4 bedrooms, 5 acres. Our first house never sold, it was in 2007 when the housing market crashed hard. I missed our first house from the day we moved, the entire time. 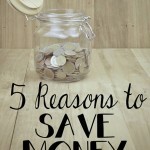 All of the things you stated above are exactly right, there is far more upkeep and costs with a larger home. We made the decision to move back into our small, cozy, familiar home. We had put a lot of blood, sweat and tears into that house, making it our home and we knew the day we moved back, it was right where we were supposed to be. Our family is very close and our children, even though they are 10 years apart are the best of friends. Our first home is where my heart is, it’s where my children have handprints in the sidewalk, my 19 year olds foot print is in the driveway cement from when she was 9 month old. All of their growth marks are on the hall doorway showing how much they have grown over the years. Not to mention we saved a TON of money. It’s a blast to decorate and landscape because it doesn’t take much, as you said. I too LOVE doing those things. I can and will never picture myself anywhere else. I want my children to come home to this house year after year, when they are grown and know this is where they belong. Aww Angie, that actually made me tear up a little! 🙂 That is so nice to hear and you’re right! We have our heights on my parents water heater door since we were toddlers. It’s cool to go back and see! Home is definitely where the heart is. We live in a “smaller” (2300) square ft. home in the same city as you, so I know exactly what you are talking about in regards to bigger houses. We’re sticking it out here for the same reasons you mention. Your blog is refreshing. You have some ideas that I love. I love this post! We are living in a small house as well and we only have one child. I’m sure it will seem even smaller if we add another baby someday. However I tried to keep in mind all the money that we are saving to provide the best future possible for our child and that makes me love our home even more ! We bought our house as a “starter” home but knew that if we got “stuck” we would be able to be okay with 2 or 3 kids. Like I said, I grew up in a 3 bedroom, 2 bath house with 4 kids (+1 more when I was in middle and high school) so it’s definitely doable. I’m so happy to see this. We are currently renting our 1800 sq foot 1960’s ranch that has been updated but with a lot of the old left too and I complain constantly that when we buy soon I want big and new because that’s what everyone our age has. My husband always reminds me though that our home right now feels like the homes we both grew up in and we both have fond memories in those homes. We have a nice backyard, our three year old daughter and five year old son are learning to share a room and my husband has an office. It doesn’t have to be fancy to be cute. 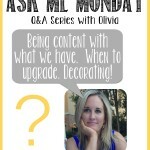 (I have a beautiful brick fireplace, and original hard woods) Love reading your posts bc they are so relatable! I laughed to myself when you said 2000 is considered small. My family lives in upstate New York and I consider 2000 a medium to large home. We, 2 adults and 2 kids(3 & 5), live in 1150 square foot ranch home. We have three bedrooms and 2 baths and a large open kitchen, dinngroom and livingroom. 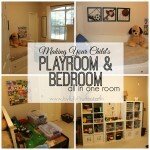 SureI’d love an extra bedroom to use for an office or playroom but I love our home. We bought our home with cash three years ago and have put blood, sweat and tears into it. 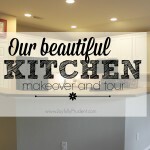 We just finished our kitchen and now onto the kids bathroom. We now basically have a brand new home. If it was any bigger than it is we wouldn’t have been able to afford to remodel. Our home is manageable. We are working today to become debt free, so I can stay home and hopefully have a couple more kids. Our kids will share rooms if this plan works out: I don’t feel a need to be house poor. Kelly I’m so glad you commented because as I wrote this post the two places I thought about were New York and California. I know it’s much more expensive to live in those places (as well as some expensive cities around the country). Cool to hear from someone in New York. I thought 2000 was a little high myself, of course here in my city I’m considered to live in a “small” house…lol! And did you say you bought your home with cash?!?! Wow, that is amazing! How cool to make changes to it as well. Buy something you can afford and then have money to make it your own. I love the term you used…”house poor”…that is great, so true. We are a family of 4 along with 3 dogs in a home that is only 986 sq. ft. We bought our home when our children were 6 & 3 (they are now 19 & 16). We all have grown close because of the smallnes of our home. Yes there have been many times and I mean many times we thought about going bigger in home. But we have just said to be happy with what we have and not worry about how big others homes are. We have a great yard and awesome neighbors. We live, we laugh and we love as a family. Plus I always joke with my husband that “tiny houses” are the in thing now, and that we were trendy before it has actually became popular. Sounds perfect to me! A big backyard is so great with kids. Now that I think of it, that’s probably why people have bought bigger houses over the years…kids are not outside as much. 🙁 And you’re right, I read a lot of articles stating a trend going towards smaller homes. I think it’s cool to see those super tiny homes and how they design them to function for a family. As a family of five, we started with an almost 1700 sq ft. house, and sold it for a 3000 sq ft. house on a tiny piece of land. Everything you stated about more expenses with a bigger house is true. We ended up selling our large home and downsized back to a 1500 sq ft house with just over an acre of land. We absolutely love it! 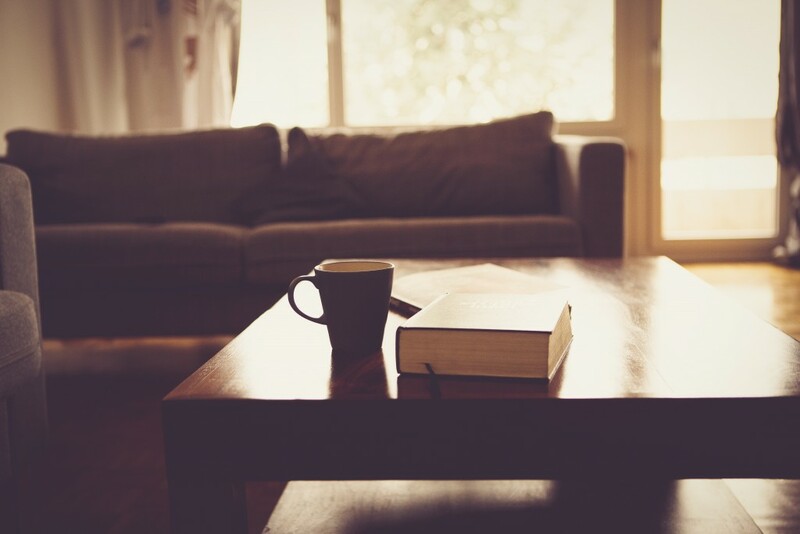 Living in a large home helped us prioritize and realize what was truly important to us. Our family. Now, we live a much simpler life and our kids are very close to each other. They will tell you, hands down, that they love living in a small home! We wouldn’t have it any other way. I am sorry but your not living in a small house! And also some of the people that are commenting about their small house living aren’t either! I live in a little over 800 sq. ft house and were a family of four! That’s small house living!!! I get relatively upset when I read post about people living in their so called” small house” REALLY!!! I’m sorry but I had to express my feelings on this issue and this POST And a reality check to yourself and others that think they are small house living is! NOT!!!LITERALLY!! Yes, that is definitely small house living in a 800 sq ft. house with a family of 4. I actually agree with you about mine not being that small (I mentioned that in the beginning and end of post)…I was just going off what the research says in America as an average (and what the general population believe in my area). My house is definitely on the smaller side where I live, but I still think it’s pretty average in size. Plenty big if we wanted to stay in it forever. Houses are very subjective in regards to size…this was just a general post based on data. There will always be smaller and always be bigger. Regardless, there are some benefits of smaller house living (as there are large house living). Thank you for commenting, especially with you living in a small home…I’m totally fine with opposing comments and it’s good to hear your side. I’m totally with you on this and I was actually thinking about this just the other day. It’s less to clean and I know the kids are learning some valuable life lessons about living in close quarters. Ours is 1500 sq. ft. and I would love something larger to we have more space to entertain, but then I’m reminded that this home was built in 1940, when homes were smaller, life was simpler, and people were just as happy. Great topic! I am probably your parents age and I live in a 1000 square foot two bedroom townhome that has been totally redone. I have a severely disabled son that I care for that lives with me. I had a much larger home when I was married and once I got divorced have lived in some smaller apartments and now I’m back up to a thousand square feet, lol. (I loved each space and fell in love with small space living .) The size is just perfect. It’s easy to clean and maintain and the utility bills are comfortable. Everything is up to date so I have a beautiful travertine bathroom, granite kitchen countertops/stainless steel appliances, wood floors, an open floor plan and it’s just perfect. I have absolutely no interest in living in a larger home at this point even if it were free, lol. The main reason for me is that it just frees up so much time. It takes so much time and energy to clean a larger house. I am pretty meticulous about cleaning and also the yard, so this is so much easier. I feel like I have more time to enjoy life. I also feel like I have enough space. I have a spacious master bedroom and beautiful french doors on the second bedroom everything just feels really nice and pretty. I think for me it’s less about size and more about luxury. There also just seems to be less waste overall. I mean how many bathrooms does a person need? Another thing I like is that there is a place for everything and everything is in it’s place. It just feels really good. You do need to pay attention to the amount of stuff you have but that is actually an advantage since you certainly need to edit to keep things nice. I don’t feel like I’m missing anything or that I’ve given up anything. In fact, I feel that I’d be giving up more time with a bigger space. Personally, I think it’s better just to stay where you’re at if you live in a great neighborhood. I’d just remodel and update the areas that you want to change and stay put. Take any money you would have spent on the new house and just enjoy life. I do understand how at that stage of your life having more space is appealing so I certainly am respectful of your opinion. I just found this post and I can certainly relate! With 4 children (and 2 parents), we have gotten very creative with storage and organization in our 1550 square foot ranch. Everything has to have a place where it belongs, or the clutter becomes overwhelming in a hurry! We also homeschool, so we spend a good bit of time using our space, but to keep my sanity it’s ALWAYS neat. I do wish we had more space for books!